The inaugural class of inductees to the Pensacola State College Athletics Hall of Fame was introduced at a press conference held Dec. 17. Honorees in attendance were Bill Brantley, Jim Donovan, Dana Gilmore, Greg Litton and Gerald McArthur on behalf of his brother, the late Bill McArthur. Other inductees were Joel Anthony, the late Mary Bailey, Charles Fairchild, Dennis Lindsay and Bob Marlin. 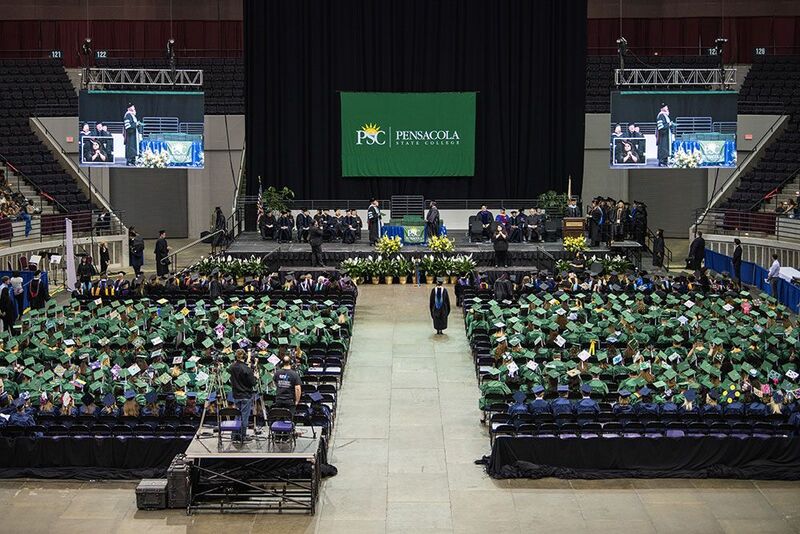 Inductees are individuals who raised the level of awareness in Pensacola State College Athletics through distinguished achievement and excellence in one (or more) Pensacola State College Athletic programs. 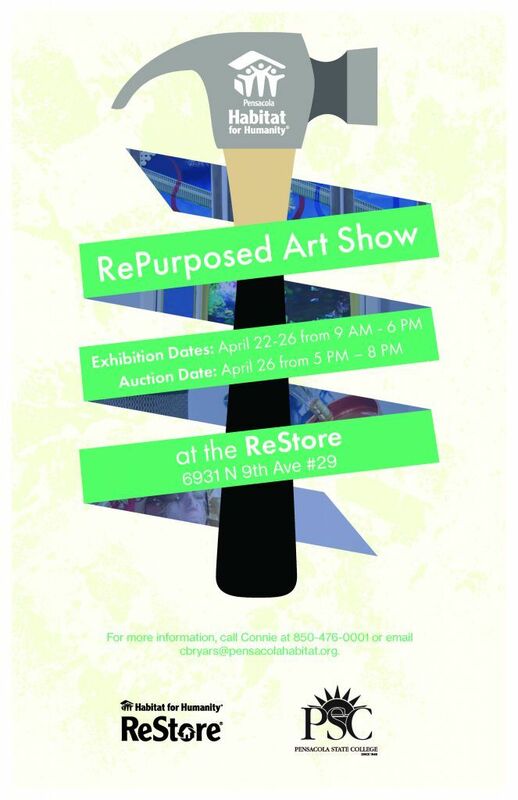 sponsored by the College; or through their contributions to Pensacola State College Athletics. 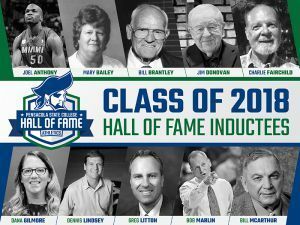 Hall of Fame inductees may include student-athletes, participants, advisors, coaches, directors, administrators, contest officials, media personnel, sports medicine personnel, athletic trainers or distinguished volunteers who exemplify the highest standards of sportsmanship, moral character and ethical conduct. Hamilton, Pensacola State’s athletic director, also unveiled the Hall of Fame logo, designed by PSC visual arts student and College Marketing Intern Darrian Montgomery. He said that a revamp of the lobby at Hartsell Arena is in the works, providing a backdrop to house portraits of Hall of Fame inductees. The Don Peery Room will gain a large wall mural. Inductees also will be able to personalize the design of their individual Hall of Fame ring. WEAR sportscaster Dan Shugart will be the master of the ceremonies for the ribbon cutting and induction ceremony, set for Feb. 16 during intermission of the women’s and men’s basketball games against Gulf Coast State College. The Lady Pirates game will begin at 5:30 p.m.
Litton, who holds the Major League Baseball record for playing all nine positions, spoke on behalf of the inductees. “I loved every day I was here. It’s where we all got our start. It’s in our heart. It’s in our blood,” he said. Inductees were chosen from a long list of nominees selected by a private committee comprised of athletic staff and coaches, other faculty members, former players and former coaches. 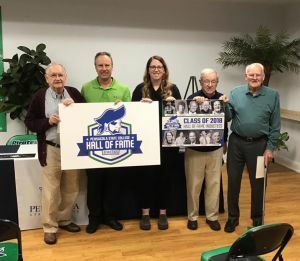 Pensacola State College Athletics is now taking nominations for the 2019 Hall of Fame class. Visit http://athletics.pensacolastate.edu/navbar-hof for more information on criteria and procedure and nomination forms. “Pensacola State has a long and storied sports and athletic tradition. This Hall of Fame will stand as a reminder for all time that these awesome individuals got their start here,” Hamilton added. Dennis Lindsay, Pensacola State’s first full-time assistant coach from 1994-96. He played guard for the Baylor University basketball team and was a member of the Bears’ 1988 NCAA Tournament and 1990 National Invitation Tournament teams. As the first assistant coach, Lindsay provided guidance to the women’s and men’s basketball teams. He also was the recruiting coordinator and ran the athletic dormitory, where he and his wife. Becky, lived. He joined the Houston Rockets organization in 1996, working his way up from assistant videographer to vice president. He also served as vice president and general manager of the San Antonio Spurs and has been the general manager for the Utah Jazz since 2012. Bob Marlin was a Pensacola State basketball coach from 1990-95. He won 100 games at the College in faster succession than any coach in school history. Twenty-seven of his players received scholarships to play at four-year schools. In 1993, he led the Pirates to the national junior college championship and was named the NJCAA National Coach of the Year. In his five seasons at Pensacola State, Marlin compiled an astonishing 123-35 record. The late Mary Bailey established the softball program at Pensacola State in 1982. A 1967 Pensacola State graduate, she was the head softball coach from 1982-94. In 1988, Bailey led the Lady Pirates slow-pitch softball team to the NJCAA Division I National Championship and was named the 1988 NJCAA National Coach of the Year. During her time at Pensacola State, she compiled a 498-166 record and the Panhandle Conference Softball Championship trophy was named in her honor. Jim Donovan was the golf coach at Pensacola State from 1987-1993. A 1951 graduate of Colgate College, he served in the U.S. Navy for 32 years, reaching the rank of captain. Donovan coached golf at Catholic High School from 1985-87 before joining Pensacola State. He lead the Pirates golf team to the NJCAA Division II National Championship in 1993, then missed a second title by one stroke the following year. Dana Gilmore is the most-decorated female athlete in the history of Pensacola State Athletics. She was a First Team All-Conference for two years running in both softball and volleyball, a two-time First Team All-State in softball and First Team All-State in volleyball. She was also a two-time Academic All-American in conference volleyball and the winner of the Jean Williams Award for scholar-athletes. Gilmore holds six softball records at Pensacola State and is the College’s all-time leader for volleyball aces. She was named to the 2003 Louisville Slugger/National Fastpitch Coaches Association NJCAA Division I All-America Team and went on to play softball at the University of Central Florida for one season. She transferred to the University of Mobile where she was a member of the 2006 Mobile NAIA National Champion team. She’s now an assistant softball coach at Tate High School where she coached the 2015 State Champion girls’ softball team. Joel Anthony was recruited by Pensacola State out of Quebec, Canada, and played basketball for the Pirates from 2002-04. After Pensacola State, he moved on to the University of Nevada, Las Vegas, where he was named the Mountain West Conference Defensive Player of the Year. Anthony signed with the Miami Heat and was a key contributor to helping the Heat win back-to-back titles. He went on to play for the Boston Celtics, Detroit Pistons, San Antonio Spurs and Milwaukee Bucks. He currently plays for Argentina’s San Lorenzo de Almagro basketball club league. Greg Litton played baseball for the Pirates in 1983-84 and signed to play at Mississippi State University. However, he was drafted in the first round of the 1984 draft by the San Francisco Giants. After five seasons in the minor leagues, Litton moved up as a rookie and hit a home run in Game 4 of the 1989 World Series. Litton played three more major league seasons with the Seattle Mariners and the Boston Red Sox before retiring in 1995. A true utility player, Litton played every position on the field during his major league career. The late William M. “Bill” McArthur was a strong advocate for local youth sports and was a long-time supporter of Pensacola State College Basketball. He played basketball for Pensacola High and was inducted into the school’s Hall of Fame. He graduated from Pensacola State in 1953, then transferred to Florida State University where he earned his bachelor’s degree. He later earned a master’s degree from Mississippi College. During the Korean conflict, McArthur served in the U.S. Army, then returned to Pensacola where he began a long career with the Escambia County School District as a junior high teacher, the assistant director of personnel and the director of personnel. He worked the table at basketball games for several local high schools, the Pensacola Tornados semi-professional basketball team, and the Pensacola News Journal and Blue Angels tournaments. As a table coordinator at Pensacola State for 42 years, he enjoyed a relationship with every president, athletic director and coach who served at the College. Charles Fairchild was a charter member of Pensacola State College Athletics program’s first boosters. He played basketball at Pensacola State from 1962-64 and was a member of PSC’s first state championship basketball team in the 1962-63 season. He was the MVP of the team and the leading scorer and second-leading rebounder both years at PSC. He went on to play at Florida State University for two years. An avid basketball fan, he was a member of the group that brought the Pensacola Tornados to the city. He served as color commentator for WCOA radio and later WSRE-TV when those stations broadcast the PJC basketball games. William “Bill” Brantley taught at Pensacola State College in the physical sciences department from 1965-95. After his retirement, Dr. Brantley continued teaching as an adjunct professor until 2009. Brantley generously contributes to the PSC Foundation and PSC athletics and created the William T. Brantley Scholarship Endowment for Physical Sciences. A former basketball player, Brantley attends a majority of Pirate basketball games with his wife, Patsy, and is a member of the Pensacola State Booster Club.